Can't find the tool that you need because it is lost somewhere inside of a tangled mess, inside of a drawer? That is where Francis Wall was before he designed the ToolHanger, his hanging tool organization system. Wall designed The ToolHanger in his garage because of a need to be more organized, but when he received request after request by his friends to build more, he decided to take his design into production. 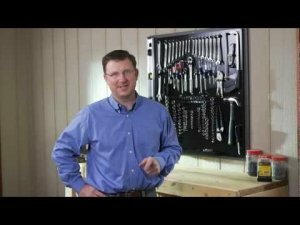 As you might expect from the name, The ToolHanger provides a place for you to hang your tools, and it does so in one central location so your tools are easy to locate and return after use. It is a one stop solution that is 34"x34" wide and is pre-drilled to mount between your wall studs. Onboard are mounting places for everything from screwdrivers, to sockets, and each place is marked so you know exactly where to return the tool. Manufacturing something like the ToolHanger is not cheap, so Wall turned to Kickerstarter to help get his project off the ground. He has everything lined up to start manufacturing The ToolHanger here in the USA, but he needs money to get the tooling. Check out the video below and see if The ToolHanger is something that your are interested in getting for yourself or for a friend, or find out more on his kickstarter page. The Tool Hanger is designed to hang any of your favorite tool brands. Each tool is outlined and finished with a high glossy polish so you know exactly where to return your tool to hang. The sockets and wrenches so you can easily identify the correct size tool needed for the job.